Parking facilities immediately surrounding the stadium require a parking coupon and open four hours prior to kickoff and close two hours after the final whistle. Soldier Field gates open two hours prior to kickoff. Parking lots may close earlier at the discretion of the Chicago Park District and stadium management. During the off-season, Season Ticket Holders are given the opportunity to enter a Random Selection Process for a chance to purchase a full-season parking coupon book in one of the lots below. Fans that purchased season parking pass booklets for the Southwest Parking Facilities at McCormick Place, through the Random Selection Process, or through the Soldier Field Premium Space program before the season did NOT prepay for Playoff games. To enter Soldier Field parking lots for this game, coupon holders will need to provide their pass and pay the fee equal to the per-game rate charged for this season. All lots accept cash or credit cards. Debit cards will not be accepted. North Garage, BLUE or ORANGE coupon. East Museum Lot, YELLOW coupon. Adler Planetarium Lot, PURPLE coupon. Family Friendly (no alcohol) Lot, OFF-WHITE AND BLACK STRIPED coupon. A limited number of single game parking passes for various lots servicing Soldier Field, may be purchased in advance by visiting soldierfield.clickandpark.com. In addition to the lots listed above, the Burnham Harbor lot has partial-season and single game parking passes available beginning in November. Grant Park North: Entrance is on Michigan Avenue between Randolph and Monroe – Regular daily posted rate. No tailgating, shuttle is provided. Grant Park South: Entrance is on Michigan Avenue between Jackson and Van Buren. Regular daily posted rate. No tailgating, shuttle is NOT provided. Millennium Garage: Entrance is located off Columbus Drive between Monroe Street and Randolph Street - $38 day of game, online pre-paid $30, $316.50 Season Pass. No tailgating, Shuttle provided. Millennium Lakeside Garage: Entrance is located off Columbus Drive between Randolph and Monroe - $38 day of game, online pre-paid $30, $316.50 Season Pass. No tailgating. 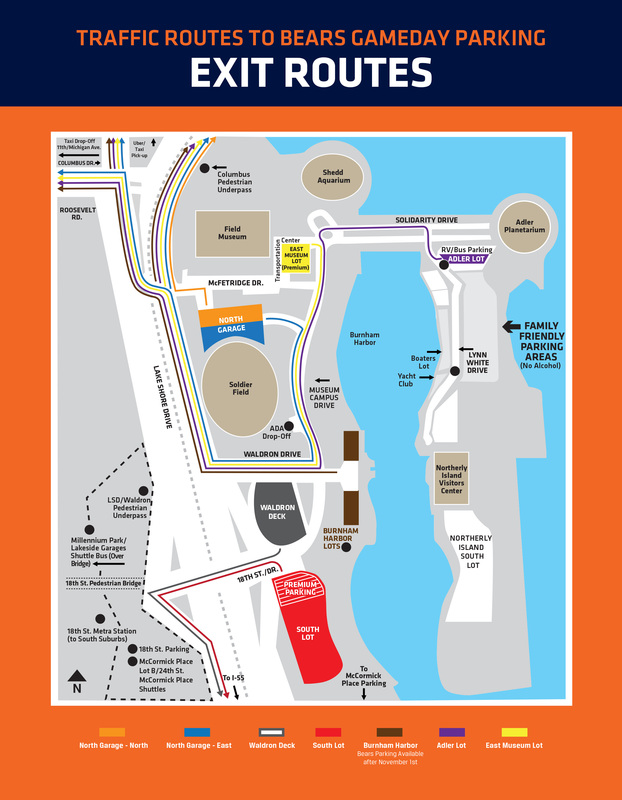 31st Street McCormick Place Lot B: Follow signs on Moe Drive off 31st Street and just west of Lake Shore Drive - $40 day of game for cars, online single game pre-paid $50, $366.50 Season Pass, $80 for buses and RVs. Tailgating is allowed. Shuttle provided. There will be a need to occasionally limit cash parking for tailgaters at 31st St Lot B due to large shows at McCormick Place. Tailgate parking will be available for full season coupon holders only on those days. McCormick Place Lakeside Garage Lot C: Follow signs on 31st Street east of Lake Shore Drive. Entrance on Fort Dearborn Drive - $35. No tailgating, shuttle is not provided. 18th Street Lot: Just west of LSD at 18th Street exit. $60 Prepaid, cars only, alcohol not permitted. Adler Planetarium Lot (RVs, campers, buses, and cars): Entrance located on Linn White Drive west of t Museum Campus Drive - $155 Prepaid for limousines, RVs, campers, and buses; $101 Premium for cars, $1,026.50 Season Pass, $50 for cars day of game when available. Tailgating is allowed. Burnham Harbor Lot (beginning in November): Entrance located on Waldron Drive and Museum Campus Drive - $50. Tailgating is allowed. Parking rates are subject to change. For more information on the additional cash parking, visit soldierfieldparking.com or call the Soldier Field Parking hotline at 312-235-7724. 31st Street McCormick Place Lot B**: Shuttles begin service 2 hours before kickoff to take fans to Soldier Field. After the game, board McCormick Place shuttles at the 18th street shuttle turnaround on the south side of 18th St. just west of Lake Shore Drive. There is limited return shuttle service available during the game. Shuttles will run until 2 hours after the end of the game. Grant Park North/Millennium Park Garages: Shuttles begin service 3 hours before kickoff and run through the first quarter to take fans to Soldier Field. After the game, board Grant Park North/Millennium Park over the pedestrian bridge at 18th Street just west of Lake Shore Drive. There is limited return shuttle service available during the game. Shuttles will run until 2 hours after the end of the game. Each parking lot is compliant with the Americans with Disabilities Act. A pre-paid parking coupon is required to park in the lots by Soldier Field. 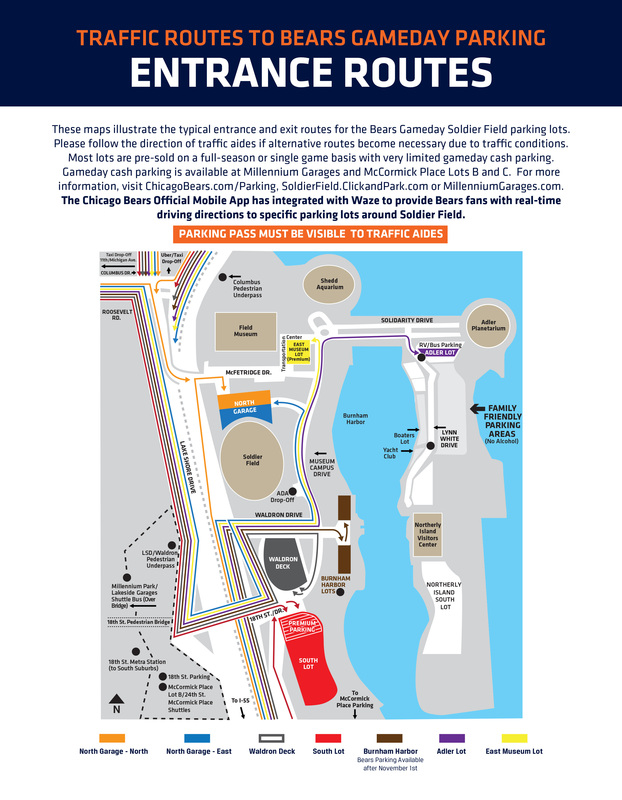 Patrons without a pre-paid parking coupon are encouraged to park at the 31st Street McCormick Place Lot B or the Millennium Park Garage and take the free ADA accessible shuttles that drop off at the ADA turnaround at Gate 14 of Soldier Field. Cash parking is located at the Adler Planetarium Lot, on a first-come, first-served basis for $150. Oversized vehicles (bus, camper or any vehicle that does not fit inside the lines of one designated regular-size parking space) can be reserved at the Adler Lot for $150 plus a $5 transaction fee by visiting SoldierField.ClickAndPark.com. When available, buses and RVs can also park at the 31st St. McCormick Place Lot B for $80. Family Friendly parking is located south of the Adler Planetarium ($50), and at the 31st Street Beach Lot ($25). No alcohol consumption is permitted in these lots. For information, visit SoldierField.ClickAndPark.com. Parking is prohibited in the residential areas surrounding Soldier Field. The area is bordered by Roosevelt Road on the north, Cermak Road on the south, Lake Shore Drive on the east and Clark Street on the west. Violators are subject to ticketing and towing. Heaters that use liquefied fuel are NOT allowed in the Waldron Parking Deck or the North Garage; they are only allowed in open air surface lots. Solicitation or distribution of any unauthorized item is not permitted in parking facilities, the stadium’s outer perimeter, or within the stadium. A parking coupon is a revocable license. The license is subject to revocation if the user of the coupon engages in unruly or inconsiderate behavior at a Bears home game, or otherwise violates parking, stadium policies or the Bears Fan Code of Conduct. SP+ reserves the right to impose at any time rules relating to the conduct of patrons at the facilities they manage. Tailgating is allowed on all surface lots of the Museum Campus, the upper level of the Waldron Deck and the Southwest Parking Facilities (McCormick Place 31st Street Lot B only). Party set-ups and grills that exceed the one designated parking space are prohibited. Tailgate set-ups cannot block vehicles entering or exiting the parking lots; set-ups in violation will be removed. Open containers of alcohol are not permitted outside of the parking lots, on the surrounding parklands or on the shuttles. Chicago Police Officers will issue citations for violators. Tailgating during the games or after night games (including McCormick Place 31st St. Lot B) and consuming alcohol in the “Family Friendly” No Alcohol lots are all prohibited. For assistance, security teams are located near the parking lots’ cashier booths or the top and bottom of the ramp in the Waldron Deck. Fans can also text the keyword “Bears” and describe the issue and location to 69050 (available three hours pregame to one hour postgame), call the security hotline 312-235-7999 or SP+ at 312-235-7724. For general information about getting to a Bears game, please contact Chicago Bears Ticket Office at 847-615-BEAR (2327) or email Ticket.Office@Bears.NFL.net. Drop-offs for Uber rides and taxi cabs are permitted at the 18_th Street turnaround west of LSD and at Balbo and Columbus Drives. Uber rides and taxi cabs can pick up patrons after the game ONLY at Balbo and Columbus Drives north of Soldier Field. Taxi cabs, limousines, and buses will not be allowed to enter Soldier Field Campus starting 90 minutes after kick-off. The campus will re-open 1 hour after the game is over. For more information regarding schedules, locations, and fares, log on to metrarail.com or call 312-836-7000. From OTC and Union Station, the #128 Soldier Field Express buses travel a non-stop route to Soldier Field. CTA’s #128 Soldier Field Express buses begin leaving the stations starting two hours before game time until 30 minutes after kickoff. At OTC, board buses on Madison Street. At Union Station, board buses on Jackson Boulevard east of Canal Street. South Shore Line runs trains on the Metra Electric Line from South Bend, Indiana to downtown Chicago, serving the southeast portion of Chicago and northwest Indiana. Exit at the McCormick Place stop at 18th Street and walk one block north to Soldier Field. For more information, log on to nictd.com or call 312-836-7000. For more information, log on to transitchicago.com or call 312-836-7000. For more information on CTA buses, log on to transitchicago.com.